The city has far more bicycle lanes and paths than it did in 1980, but Ms. Weinshall said bicycling was a less-attractive option because of the cold weather. The 1980 strike began on April 1 and lasted 11 days. There you have it: Iris more or less admitting that people will choose biking as transportation if weather and other conditions, such as the availability of transit, allow. Despite casual family décor like the plastic yellow PreSkool table in the den and the pack of bikes parked in the living room, the Schumers’ three-bedroom apartment is still downright luxurious compared with the D Street house. Mr. Schumer sleeps in a real bedroom and even has chests of drawers. See? Iris and Chuck like bikes so much that, like many New Yorkers with a lack of good storage space, they keep their bikes in their apartment, or at least they keep them around to give off a just-folks image to Times reporters. This is from a written statement, so it’s no accident that Chuck chose to reference his bike here — it’s political calculation. He can’t exactly go on Meet the Press wearing skinny jeans, but he can say that he rides a bike to make sure everyone knows he’s just a hipster at heart. I’m happy to add more examples of Chuck’s love for bicycles and Iris’ acknowledgment that New York is, for the most part, a walking city. Please add what you can in comments or send me an email and I’ll update the post. 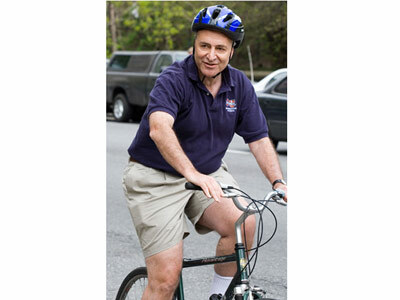 One other thing you can hopefully help me with is this: how can Chuck Schumer square his love of biking–to to mention his love of the bicycle as a political prop–with his work behind the scenes to get the bike lane that thousands of his neighbors love removed? This is from a book Schumer wrote called Positively American. “I’m a numbers person. I read polls; I love analyzing data.” Wonder if he will analyze the dot data?? I don’t know if there is still the Senate Bike Caucus but ole Chuckie was on it.